With so many festive lights adorning the streets of Orchard Road and Christmas carols being played all across town, there is no denying that the holiday we have all been waiting for is finally here. That’s right, it means that it is time to shop without restraint and more importantly, feast like there’s no tomorrow. This Yuletide season, prepare to embark on a gastronomic adventure with the endless array of tasty offerings by highly renowned buffet restaurants such as Royale at Mercure Singapore Bugis, Edge at Pan Pacific and the unbeatable 10 at Claymore at Pan Pacific Orchard, Singapore. From roast lamb to a gorgeously carved Christmas turkey as well as an array of delectable local and international dishes and desserts, this is perhaps something worthy of your year-end holiday plans this year. 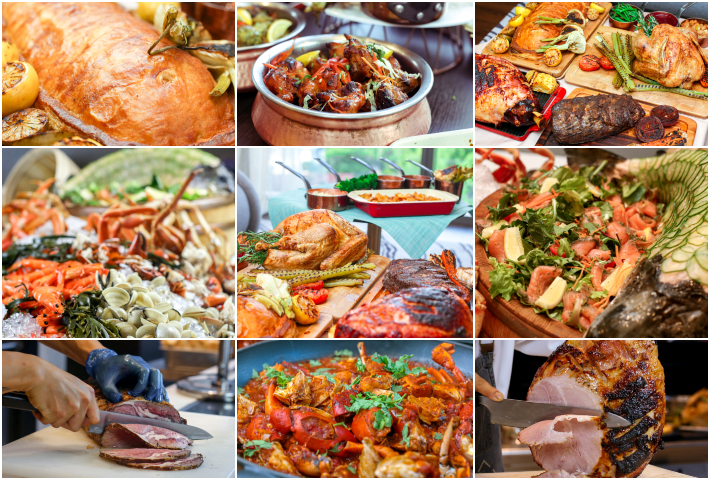 If the thought of whipping up a Christmas feast at home frightens you, why not head out for a merry buffet instead? It takes the hassle away from all that tedious prep and all you have to do is literally sit back and stuff yourself silly. 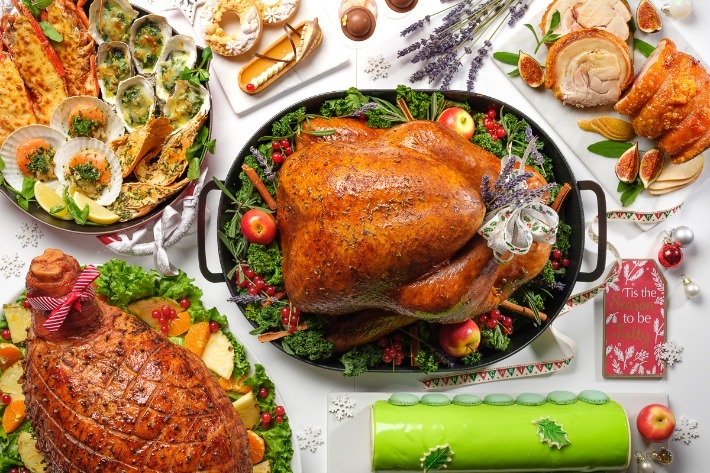 Here are 5 Christmas buffets in Singapore this year that you and your loved ones can indulge in this Christmas—just be sure to make your bookings early! Christmas is less than twenty sleeps away and we are all psyched for a festive Yuletide with our loved ones over a good buffet dinner. Whenever we want something that suits the dynamics of a family with three generations, one of our favourite spots is PARKROYAL on Beach Road’s all-day-dining restaurant, Ginger. Drawing inspiration from Singapore’s diverse cuisines and cultural influences, what diners can look forward to at Ginger this festive month is a value-for-money buffet spread that comprises both local delights and traditional festive roasts—few of which are given a lick of Asian flavours for that special kick. Helmed by our friend Executive Chef Low Hoe Kiat, Ginger will showcase thematic dishes such as Oven-Roasted Goose infused with Five Spice and Onion Marmalade, Turkey with Chestnut Stuffing, Seafood Paella as well as his signature slow-braised Pumpkin Crab in Claypot. Whether you’re a devoted crab lover or just someone looking to stuff yourself silly, this buffet spread will please both the young and old in the family. Simply quote ‘ladyironchef x Christmas’ upon making your reservation to enjoy Ginger’s dinner buffet at S$58.50++ per adult. This promotion is valid from Mondays to Thursdays from 09 December 2017 to 29 December 2017, and it is not available on the eve of and public holidays. While there are always new and trendy restaurants to check out every week, mezza9 at Grand Hyatt Singapore remains a perennial favourite when we want to reward ourselves with a good meal. Places like these comfort you with their promise of delivering consistently quality dishes in a familiar environment, with a team of dedicated staff to pamper and make you feel at home. The theme for Grand Hyatt Singapore’s Christmas 2014 is aptly named ‘A Grand Welcome Home’. Whether it is a sumptuous Christmas dinner with your family, a gathering with friends, or a romantic date with your partner – dining at Grand Hyatt Singapore always makes you feel all warm and fuzzy inside. Take the opportunity to treat yourself to a feast, book a table at mezza9 for a Christmas Eve Buffet Dinner and Christmas Day Brunch, and reward yourself for a whole year’s of hard work! From 1 to 25 December 2014, mezza9 presents a festive ala carte menu that uses the freshest seasonal ingredients. And there is a 15% early bird discount if you book for New Year’s Buffet Dinner before 15 Dec 2014.